If you own a Brother embroidery machine such as the Innovis 1500(D), 2200, 4000(D), 5000, NV1(e) and V-Series models (in fact any top of the range models that may be released after writing this article) it’s a good idea to periodically check if updates have been posted onto the Brother website. 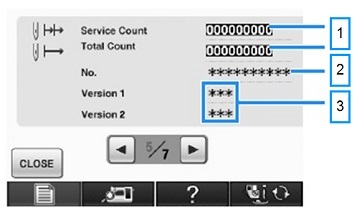 The technical term for the software running your machine is “firmware” and some of the reasons for these free updates include improvements to the machine’s general operation or new features like extra embroidery frames being recognised etc. You can also purchase Upgrade Kits for some machines which usually consists of accessories as well as adding significant new features to the machine. Firstly you need to check the firmware version that your machine is currently running. 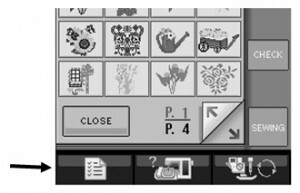 You’ll find this by going to the Machine Settings section of your machine which is usually the bottom leftmost icon on the screen. In this example of updating more recent models (in this case a V5 machine) you will just download the latest version available. In all cases the date of the release is shown which can be quite useful to know. Step 11. 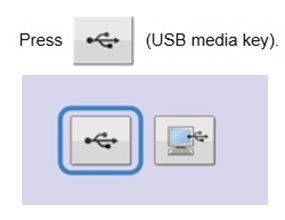 Once you have downloaded the upgrade file copy the upgrade file to a blank USB flash drive/memory stick and insert it into your machine with it switched off. Step 12. Wait for the upgrade to complete and then switch off the machine. Step 13. 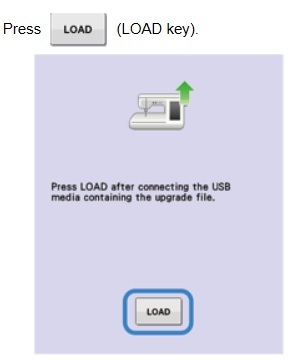 Remove your USB flash drive and switch the machine back on. You can now check that the latest version has been installed by going back into the machine settings. This entry was posted in Support and tagged brother, embroidery, innovis, sewing, update. Bookmark the permalink. I have a pe design lite, is there an upgrade available for this available, I have found that is one but no download for it. Not available in the UK Tracey. Do you happen to know if the very latest update to the PRS 100’s firmware will change the way one can customize their designs? Right now I can draw my own design and convert it to pes file and then use my machine to embroider it. The latest update says there are fixes for “other issues” and I’m wondering if they’ve made it so that we can no longer save exp files generated from an embroidery file conversion site. Sorry Jens, I don’t know. Maybe the tech guys at Brother USA will be able to clarify if you are having problems with this model. Keith. I tried several times to upgrade my innovis 1500d, but no success. It doesn’t have a flash drive portal, but it does come with a usb plug. When I plug it into my computers it does not read it. My computers only flashes in & out the flash drive. Please help me. I have a computer that has Windows 10 & another one with vista, but neither one has been able to upgrade my 1500d. I’ve uploaded the proper drives several times, but success. Please help. Hi Yvette, Your 1500d firmware is the original version from when the machine was sold. At this time the operating system for PCs was Windows XP and when Vista came out Brother created the update so that the 1500d would be compatible. The problem you now have is that you can’t upgrade the machine using a PC that the machine can’t communicate with (Vista, Win 7, 8.1, 10 etc)! You need and XP computer to update the machine and then you can use it with later Windows operating systems. I keep an old XP laptop to help my customers with this so you can still do it :) – Keith. Thanks very much. I am in va, I sure hope I can have some luck finding an XP computer. Keith, thank you for updating my V3 yesterday. She is sitting on my work table this morning calling to me to use her. As usual superb friendliness and hospitality, The six hour round trip is so worth the service you provide. WOW Keith…..I have always asked my son to do updates for me but your instructions are first class. I used a USB stick and I am now on 4.03. I can’t thank you enough. Why can’t all dealers be as helpful as you? Thankyou for taking the trouble to put this on your blogg I think that a lot of people don’t realise you can do these upgrades yourself. Comment much appreciated Sarah. 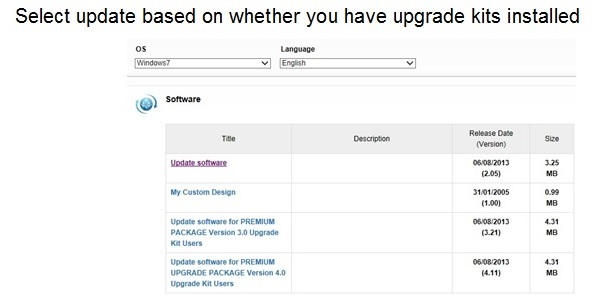 In a sense you could call them upgrades but just to clarify for everyone, updates are free downloads – upgrades are the ones you buy and usually come with accessories. Keith. What is the latest update for the nv1? What do the updates do? I’ve read your article with great interest on tensions. I think I have had a problem with that and will try what you have suggested. Many thanks. The latest update at this time is 4.03. Depending on which version your machine is currently at there may have been quite a few updates right up to the latest. To find out what all the updates have done you can read the Update History which explains them all in order of release. To see these follow my blog to Step 9, click on the Update Software link, click on Agree the EULA and Download. The next page tells you How To Install and if you scroll past the instructions you’ll see the complete history with details of improvements that were applied. Just update to the latest and all previous updates are inclusive. If you’re still confused give me a call :) Keith. I tried to load the latest upgrade to my V3 without success. I am showing 1.04, so thought 1.13 would be the latest version, but no success with loading on to my machine, kept getting the message correct file not found, so I guess it is a trip up North in the future to see you. I am convinced my machine likes the outings to see you. Phillipa, try using a memory stick that doesn’t contain any other data on it. Sometimes other files can block your machine from “seeing” the download file. Try using one less than 8Mb. Check that the file definitely transferred to the memory stick from your computer. Your V3 will update if it’s done correctly but don’t worry, I’ll do it at service time with pleasure :) Keith. Thank you Keith for supplying this info, the Brother site, unlike their machines, is not the easiest one to navigate, and their help team are not very customer friendly if you don’t grasp what they are telling you immediately. With this print out from you I can’t go wrong. Thanks for your comments Jean. You are the techno wizard that helps to keep your embroidery group on the go when they run into hiccups. I’m sure you’ll be passing on the tips as needed and as usual just holler if you get stuck. Keith.